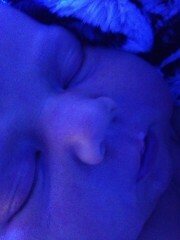 So we were told Shiloh was being readmitted to the hospital due to her jaundice levels. Our friend L came to help with the big kids so we could go. I mostly cried. Breasfeeding was failing us, my baby was going back to the hospital, and the nurse had suggested she had a condition that would require surgery to correct. It was a post-partum nightmare. We got back to the hospital and checked in. Shiloh was dehydrated so she needed an IV. The doctor felt that once she was hydrated, she would start to poop again and the vomiting would subside. I could only hope. I couldn’t bear to watch, so Skip went to the other side of the room with her where they pulled the curtain and poked at her for what felt like an hour. I listened to her scream as I sat there and cried myself and then they brought her back to me – with no IV. They couldn’t get it in. I held her and nursed her and she went under the lights. They came back a while later to try the IV again and thankfully they called for a nurse from the special care nursery who was able to get it this time. Her cries were just so hard for me to heart at this point. I felt like my body had failed her and she was being poked with needles. Skip says it was really just the tourniquet she cried about, but it still felt awful. I slept on the couch in her room that night. I was thankful for my sleep mask, as the lights made the room bright blue and near impossible to sleep. The nurses were great about feeding a breastfeeding mom and I got 24/7 snacks and drinks in addition to meals. I was still weak from the anemia, so I called for nurses to help me get Shiloh out of the isolette wen I needed to feed her. I am so glad I had the NICU experience with the boys because I knew how to work the machine, how to turn them off to unplug her wires so I could hold her without being tied to the isolette. I actually had to show a few of the shift nurses how to do it, which wasn’t exactly reassuring, but we were on the pediatric floor, so I guess they don’t get a lot of tiny babies. I mostly slept, nursed and pumped, trying to get my milk to come in. A nurse or a doctor suggested it wasn’t normal that my milk didn’t come in yet (it was only day 3) and it further undermined my faith in my ability to nurse. I know up to day 5 is completely normal, but to be in such a weak, emotionally torn and vulnerable state, to have a person in the medical field telling you it’s not normal made me feel worse. Momma’s milk finally came in! See the little dribble on her lip? 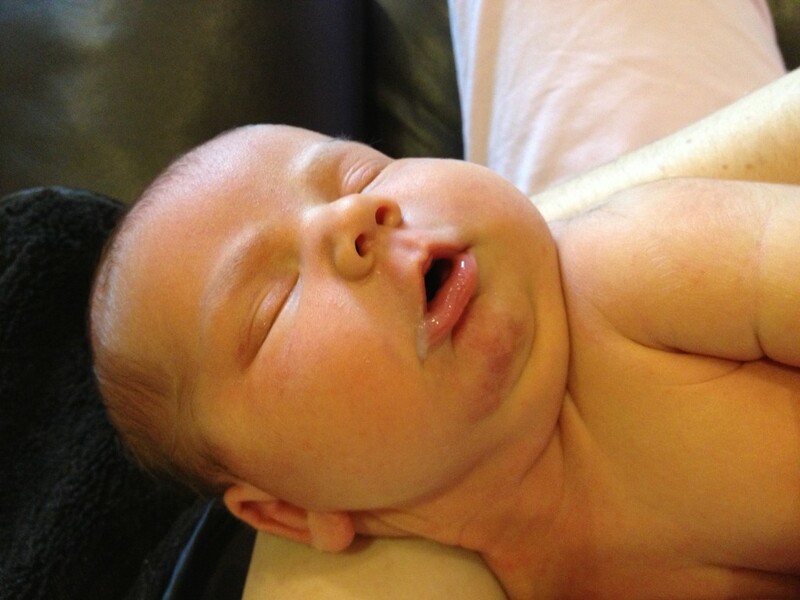 My milk came in the next day (day 4) but her bilirubin levels had gone UP from the day before. We were told if she was down to 11 the next day, we could go home. So I continued to stay with her, pump, and nurse. I woke every 3 hours to nurse and Skip was home with the big kids. He visited us during the day. Shiloh finally pooped again and I can’t tell you how excited I was for that moment! Things were starting to work again. Her vomiting was also turning into normal baby spit-up again. The next day (day 5), her levels that morning still weren’t low enough to be sent home. I was so disappointed. Dr. H, who delivered her, told me they normally only test once a day, but he would test her again at noon and if they were at below 14, we could go home. At one point, a new nurse came in and introduced herself. She told me how beautiful my baby was, and then saw my post-partum belly and said, “And you’re expecting again!” I looked at her thinking she must be joking, but the vapid expression on her face told me otherwise. I said, “Uh, my baby is FIVE DAYS OLD” and gestured to the isolette. And then this woman who clearly was lacking either her brain-to-mouth filter or a basic knowledge of reproduction informed me she was the lead nurse for the day. Wow. Anyhow, we waited a while longer and after the re-test, she was at 13.8. We barely made it, but Dr. H kept his word and we left for home – again – around 3 pm on day 5. Skip had used all his sick/vacation time for her first week “home”, but that week was mostly spent in the hospital. I asked him to please take unpaid time – we would make it work somehow – and take a few more days to be with us, at HOME as a family, and he did.